Since berry season is coming to an end, i decided to bake a mixed berry muffin for this week. They are healthy and easy to make. Pre-heat oven to 350 degrees. Line and spray muffin tray or use silicone muffin cups. In a small bowl combine oats and buttermilk. Let stand for 5 minutes. In a separate bowl combine whole wheat flour, baking soda, baking powder, sea salt and ground flax seeds. In another bowl mix egg, applesauce, brown sugar and vanilla. Add buttermilk mixture to wet ingredients and mix once again.Stir in flour mixture and then fold in berries. 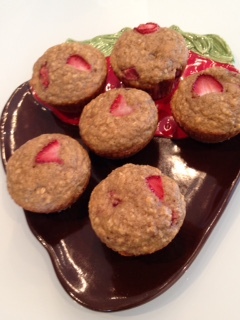 Fill muffin cups with batter and then slice strawberries to garnish each muffin. Bake for 25 minutes or until tooth pick comes out clean. Let stand for 5 minutes and then transfer to calling rack. Enjoy!